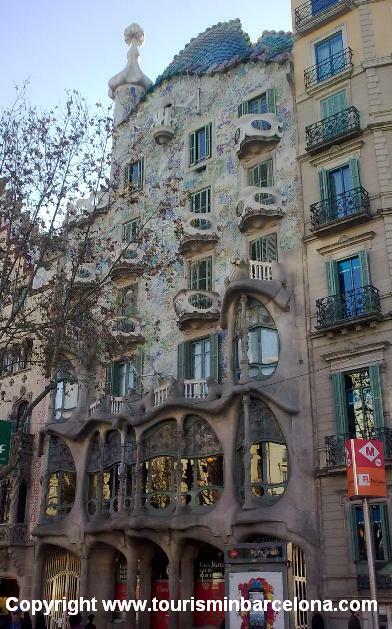 Also known as ‘Casa dels ossos’ (House of Bones) because of its shapes, Casa Batlló is another of the famous creations of Antonio Gaudi. Located in Paseo de Gracia (in the same street that La Pedrera but closer to Plaça Catalunya) offers, as well as ‘La Pedrera‘, a magnificient view of this great avenue. Casa Batlló was built in 1877 and restored by Antoni Gaudí and Josep María Jujol between 1904 and 1906. The main objective of the designer was to avoid straight lines completely and when seeing it, anyone gets the idea that it was achieved without doubt. 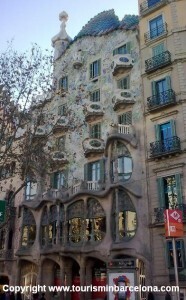 Comparisons between ‘La Pedrera‘ and ‘Casa Batlló’ are unavoidable and higly depend on the opinions of each person. We recommend that if you have interest in knowing the work of Antonio Gaudi, visit both buildings as you will not in any way disappointed. Address: Paseo de Gracia 43 (Metro Paseo de Gracia L2, L3, L4) only 5 minutes walking from Plaça Catalunya.